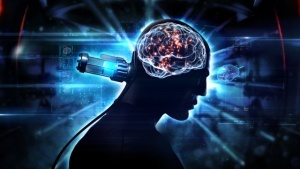 Transneural technology is now available to everyone. You can now remove unwanted skillpoints from skills you've trained in the past and either consume or sell the Skill Injector afterwards. You can now instantly improve your skills and break away from the previous limitations of having to either spend time training or purchase a character someone else has trained. You can now farm skillpoints and sell them on the market, much like people farm characters to sell on the Character Bazaar. 3.3 How much time does an injector buy me? The Skill Extractor window shows what skills you cannot extract. It's a consumable item that removes skillpoints from your own character in order to create a new item called a Skill Injector and transfer the skillpoints into that item (the extractor itself is used up in the process). This allows you to sell or give away a portion of your skillpoints or simply redistribute skillpoints from one skill to another. There are diminishing returns as you get more and more skillpoints in total however, so keep that in mind. 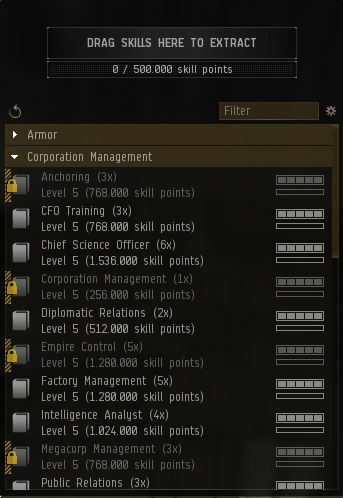 You can purchase Skill Extractors from the New Eden Store (NES) with PLEX, alternatively with ISK if someone else has bought it from the store and put it up for sale on the regular market. While the PLEX cost is set by CCP in the store, the ISK price on the regular market will fluctuate based on supply and demand. Once you have a Skill Extractor you activate it and get a list of your skills, allowing you to pick and choose which skills you'll extract skillpoints from. This process will remove the skillpoints from that skill and they will be lost, dropping the skill down to a new level based on remaining skillpoints. The Skill Extractor is also consumed in the process, leaving behind a Skill Injector. You need to be logged in through the fully supported game launcher to use Skill Extractors (this is to support, but doesn't require, two-factor authentication for skill trading). Need to be docked in a station, sitting in your pod. You need a minimum of 5,500,000 skillpoints to use an extractor (can't drop below 5 million skillpoints). A single extractor holds 500,000 skillpoints (500k) and the total worth of skillspoints for the skills you select must equal to or exceed this number in order to create a Skill Injector. You cannot extract skillpoints from a skill that is a prerequisite for another skill, so if you want to get rid of a whole chain of skills you'll need to extract the skills from the top down. Unless dismissed, you'll get this prompt whenever you access your Skills tab in your Character Sheet window. It is a consumable item that will give you anywhere from 150,000 - 500,000 unallocated skillpoints that can be used to boost any of your existing skills or saved for later. The item is destroyed once used. You can purchase and trade Skill Injectors on the regular market, just like any other item. Since the item is placed on the market by players for players, the price can and will fluctuate based on supply and demand. Depending on your total amount of skillpoints, you receive more or less of the skillpoints stored in the Skill Injector when you use it. If you have less than 5 million skillpoints you gain the full 500,000 skillpoints (100% worth). If you have between 5 - 50 million skillpoints you gain 400,000 skillpoints (80% worth). If you have between 50 - 80 million skillpoints you gain 300,000 skillpoints (60% worth). If you have more than 80 million skillpoints you only gain 150,000 skillpoints (30% worth). These brackets apply regardless of whether you're injecting your skill injectors one by one or all at once. So if you inject 10 skill injectors at 4,9 million skillpoints, the first one will give you 500k skillpoints as you have less than 5 million skillpoints, while the remaining 9 injectors will only give you 400k skillpoints worth since after the first skill injector you moved into the second 5 - 50 million bracket. How much time does an injector buy me? To put this into perspective, it might be good to know roughly how much time you're actually "saving" by purchasing a Skill Injector instead of just waiting for the skills to finish naturally. Small, Large, and Daily Alpha skill injectors are identical in functionality, but come from different sources. As with the usual Alpha clone restrictions, up to the full Alpha-accessible skillset of 20m SP may be injected without being in Omega state. It does not matter whether skills past 5m SP (but under the total of 20m in the whole Alpha set that may be accessed) are acquired through injection, or time previously spent as an Omega. Apart from the obvious choice of simply train the skills over time, you have a few other options to acquire extra skillpoints; Multiple Character Training using PLEX or purchase a character from the Character Bazaar. Each method will have different pros and cons, most noticeably regarding time and cost. Using a 30 Day Pilot's License Extension (PLEX) allows you to train another character on your account for 30 days (normally you can only train on one character at a time) or even use as gametime for another account to run and train on a separate account. Both of these options are limited to training other characters and cannot give your main character more skillpoints and it still requires time to train the skills at the usual pace. Obviously this will not be an option if you're looking to improve your main characters, or any character you're already training with. But if you're looking to improve one of your secondary characters and cost is more of a factor than time, then this might be a good alternative. ^ The number of skillpoints you have on your character, see Diminishing returns above. ^ 1,800 skillpoints / hour is what you get with your default remap and no implants. ^ 2,200 skillpoints / hour is what you get if you use +3 attribute implants and have the appropriate neural remap. ^ 2,700 skillpoints / hour is what you get if you use +5 attribute implants (requires Cybernetics V) and have the appropriate neural remap. If you don't need the skills on an existing character and you have room for another character on your account (each account can hold three characters), you have the option of buying a new character from the Character Bazaar. The comparable value of a character bought from the bazaar and the value of injectors to get the skills can't really be compared on total skillpoints of the character, as it might have skills trained that you don't need or benefit from. But if you consider the total amount of skillpoints of the skills you need, then compare the price of the character to the price of buying enough injectors to achieve the same result, you'll be able to gauge which is the cheapest. You could also combine the Bazaar and injectors, by getting an undervalued character and "top it off" with injectors to make it more useful to yourself, or more desirable on the Bazaar if you intend to resell it. Here are some common scenarios and the costs/profits involved. There are probably other scenarios as well that doesn't adhere to the examples mentioned above, so always do your research. 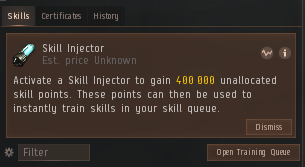 If you're buying PLEX to facilitate the training and then pay ISK to get the extractors from the market, then you'll be able to extract at least 3-4 injectors a month (at 2,700 skillpoints an hour you get 1,944,000 skillpoints in a month). So for that to be profitable, you'll need to sell the injectors at a price that's higher than your initial investment. For example, if PLEX sells for 1,2 billion ISK and extractors cost 300 million ISK then the costs of training and extracting 4 injectors a month (rounded for simplicity) is 2,4 billion ISK (1,2 billion + 4 x 300 million). In order to just break even selling injectors you'll need to price your injectors above 1/4 of that, 600 million ISK a piece (2,4 billion / 4), and for a profit you'll have to price it higher than that. If you're using real money to subscribe (in order to have an account to train on) and again real money to get extractors, you should compare the relative ISK per real world currency spent. If 4 injectors doesn't yield as much ISK as however many PLEX you get for the same price, you'd make more money simply selling PLEX straight up. For example, say you pay €10.95 for your subscription (cheapest if you go for a 12-month plan) and fork out €17,99 for 4 extractors a month (cheapest extractor from the bundle of 10 is €4,50 each). That amounts to €28,99 a month. If you spent that buying PLEX for €14,87 a piece and sold those, you'd pretty much be able to sell 2 PLEX a month instead. If PLEX sell for 1,2 billion each that means you'd have to sell the 4 injectors at a price above 600 million ISK (2,4 billion / 4) to turn a better profit. If you're using the account anyway and for some reason have no need to train anything (the account might be filled with specific alts already trained for their purpose), you end up changing the dynamics for profitability. The ability to train in this scenario doesn't cost you more, you're already subscribing to use the account, so the above mentioned formula is changed to simply weighing the cost of extractors vs the profit of selling injectors. Since one extractor makes an injector to sell, if an extractor costs 300 million ISK then anything above that is pure profit in this scenario. Buy skill injectors. This can be done by buying at the in game market price, in ISK. Training an alternative character on the same account as the target character. This can be done by buying Skill Extractors from the New Eden Store or the in game market. This strategy also require a Multiple Pilot Training Certificate, also buyable in the New Eden Store or the in game market. Training an alternative character on an alternative account. This can be done by buying Skill Extractors from the New Eden Store or the in game market. This strategy also require a PLEX (buyable with ISK or money) or a subscription for the activation of the account. This page was last modified on 4 January 2019, at 18:38. This page has been accessed 51,903 times.